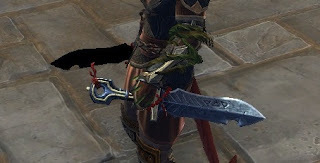 Neverwinter Thoughts: Cheap Artifact Gear For Everyone! Cheap Artifact Gear For Everyone! I've mentioned before that if you follow an MMO only casually, updates can be full of all kinds of surprises. Both my pet tank and I went all wide-eyed when our Alliance leader told us that there are now craftable artifact weapons and off-hands which are better than the ones that we were using before, even in their most basic green state as they start at item level 415. And the best thing? People are selling them on the auction house for (what feels like) ridiculously little, less than 20k AD a pop! They probably have some downside to them that makes them less than ideal for min-maxers, but for more casual players like us this is absolutely amazing. I immediately went out and bought a set for every single one of my max-level alts, who were usually still sporting purple versions of their Elemental Evil main and off-hand at item level 390. New daggers for my rogue. It's a bit sad to have to start refining from scratch again, but it does feel a lot better with the new refinement system. I'm just not sure what to do with my old weapons now, as they took out the bonus that allowed you to transfer most of your progression from old to new. Another downside is that I'll be losing a lot of nice looks unless I'm willing to completely destroy the old gear to preserve it: For example my great weapon fighter was using a weapon skin from the winter festival, and my control wizard one from the summer festival. Oh well, they will come around again.